Rugs bring warmth to a room with hard surface floors. However, rugs can harbour dirt, mould, and bacteria. Rug cleaning is essential to prolong the life of your rugs. You need a professional with the expertise to clean your rugs. Whether on-site or off-site, you can trust your valuable rugs to these rug cleaning companies for the best results. Do you know a rug cleaning business that provides exceptional cleaning and outstanding customer service? Tell us and we will start the verification process. With an in-house rug cleaning factory and IIRC trained technicians Bright Aire is up to the challenge of your dirtiest rugs. You have the option of pick-up and delivery or drop off at the factory. Bright Aire uses equipment that will clean both sides of your rug and also offers a fringe brightening treatment to bring fringe back to life. Fibres are gently but thoroughly cleaned before the rug is placed in the specialised drying chamber. Alpha Chem Dry specialises in short pile and long pile rugs as well as fine oriental and Persian rugs. They use a combination of a green-certified solution and carbonation to effectively clean and deodorise your rugs. Only Alpha Chem Dry offers PURT service for pet urine and odour removal treatment. All Aces is fully equipped for your rug cleaning needs. Whether it is on-site rug cleaning in your Brisbane home or office or thorough cleaning in their off-site facility, All Aces has the skills and training to get your rugs looking their best. If you need to store or ship your rugs, All Aces provides Tyvak wrapping of your cleaned rugs to prevent mould and insect damage. Sunstate can either wet or dry clean your rugs in your home. If you are unsure of what method is best, trust your Sunstate trained technician to provide expert advice. Deodorising and odour removal services available as well. You can trust your fine oriental rugs to Sunstate. Their attention to detail is what makes the difference. KCJ Enterprises has vast experience in the cleaning business. They use only the best and most efficient equipment to clean your rugs. Their fleet of truck-mounted high pressure steam and extraction equipment is on call 24/7 for emergency water and fire restoration. Their total commitment to client satisfaction makes them a leader in Brisbane rug cleaning companies. Sunstate Cleaning Services offers professional rug cleaning in the Brisbane area. You will be satisfied with the work or it is free! They have been servicing the Sunshine Coast to Tweed Heads since 2000. Their staff of experienced, fully insured and licensed cleaning professionals is ready to offer an immediate response to your rug cleaning needs. Fast and friendly service with attention to detail is what has made them a favourite for rug cleaning, carpet cleaning, and more. Dust mites and pet urine stains and odours are no problem for Sunstate Cleaning Services. They can clean, refresh, and revitalize even tired looking rugs. Deodorising services are available to remove smoking, cooking, and pet odours as well. What Can you Expect When Your Rugs are Cleaned? Whether your rugs are cleaned in home or at an off-site cleaning facility, there are a few things you can expect when using a rug cleaning company. Your cleaning technician will first make an inspection of the rug to be cleaned. This includes determine the fibres used to make the rug, the type of backing and the size of the rug. If it is an oriental or Persian style rug, the country of origin may be noted as this makes a difference in the dyes used. Next, the rug will be inspected for the degree of soil and staining to be removed. Special note will be made. All of these factors are used to determine the cost to clean the rug. First the loose soil will be removed with industrial quality vacuums. If the rug is cleaned off-site, both sides of the rug will be vacuumed. 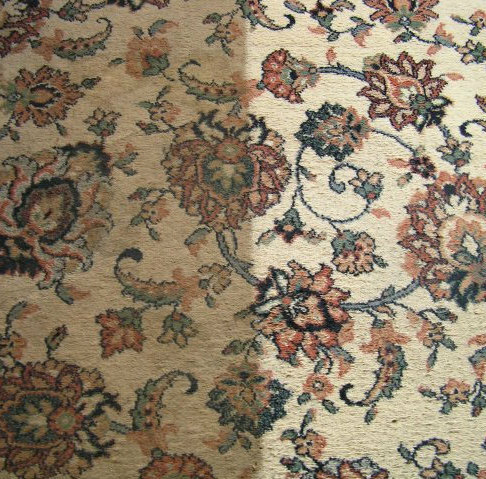 Depending on the type of rug and whether it is cleaned in house or off site, the rug cleaning solutions and will be applied to remove soils. Stains are generally pre-treated before this step. If the rug is cleaned in house, an extraction unit will be used to remove as much moisture as possible. If the rug is cleaned off-site it will be moved to a “drying room” which is temperature and humidity controlled to prevent moulding or shrinking of the rug. If your rug is cleaned in house, the technician will give you an approximate drying time and advise you when you may walk on the rug again.